angry at a trade that inflicts untold misery and death across the planet. Protesters manoeuvred kayaks in front of the ships to prevent them gaining access to Royal Victoria Dock. At a time of austerity and government cuts, East London will be hosting Defence Systems Equipment International (DSEI) from 13th – 16th September, with much of the cost borne by the taxpayer. and suspected war criminals in an attempt to persuade them to buy British weaponry. 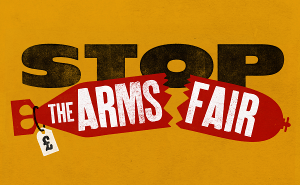 Many of the weapons used by dictators to kill demonstrators during the Arab spring were procured from DSEI exhibitors. This year DSEI falls on the 10th anniversary of the 9/11 attacks that killed nearly 3,000 people. It is worth remembering that (according to the British Medical Journal) nearly 400,000 people die every year from armed conflict. This is just one action in a concerted campaign. Protesters have vowed to disrupt DSEI throughout the week, including a day of action on the 13th to blockade the DLR and prevent delegates attending the event. Several warships will form part of this year’s DSEI – hosting receptions and showcasing military technology, including HMS Dauntless, the pride of the British Navy. the world, including military delegations from some of the world’s most repressive, human rights abusing regimes. DSEI is held in Newham, one of London’s most impoverished boroughs. Whilst the government has subsidised DSEI by £320,000 and paid up to £4million for policing, Newham council are being forced to cut £116 million from their budget over the next four years. defence contractors have also sold small arms ammunition to Syria, hand grenades, sniper rifles and tear gas to Saudi Arabia and shotguns to Morocco.